Cleanliness is a crucial issue to ensure patient safety in treatment rooms for any medical facility and it is equally important in dental offices. 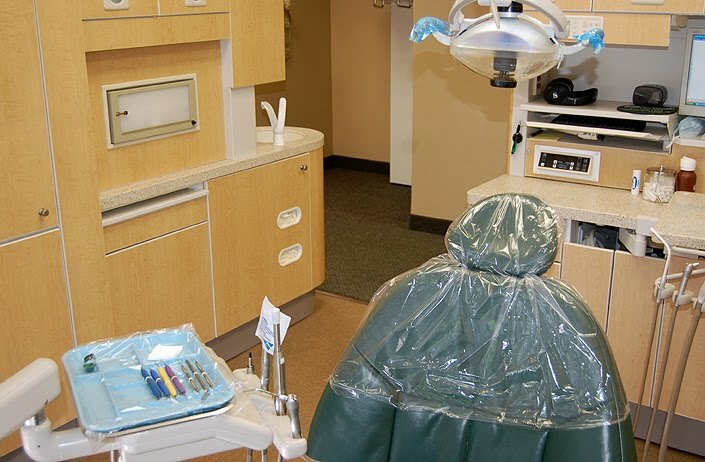 At Roselle Dental Center, we take the sterilization of our treatment centers very seriously. rooms: cleaning, disinfecting and sterilizing. A checklist of sanitation tasks is to be completed by our office staff after every procedure. Disinfection is the process of killing pathogens. The Centers for Disease Control (CDC) defines three levels of disinfection--high, intermediate and low--for "patient care items" that do not require sterilization, and two levels--intermediate and low--for environmental surfaces. These levels are rated according to a disinfecting product's antimicrobial "kill factor." The intended use of the patient care item determines the recommended level of disinfectant. Include the appropriate disinfecting product for each task in the overall hygienic safety plan. Both the EPA and the FDA have rules to regulate the use of disinfectants and sterilizers. The Occupational Safety and Health Administration (OSHA) and the CDC also play a role in ensuring patient safety in treatment rooms. Designing and implementing an effective program for cleaning, disinfecting and sterilizing treatment rooms requires a health professional to research and understand the roles played by these various government agencies. Today, our staff at Roselle Dental Center, will take you on a tour of our sterilization center as well as a step by step demonstration of how we meet and exceed guidelines for the sterilization and disinfection of our dental instruments. Critical Instruments are those used to penetrate soft tissue or bone, or enter into or contact the bloodstream or other normally sterile tissue. They should be sterilized after each use. Sterilization is achieved by steam under pressure (autoclaving), dry heat, or heat/chemical vapor. 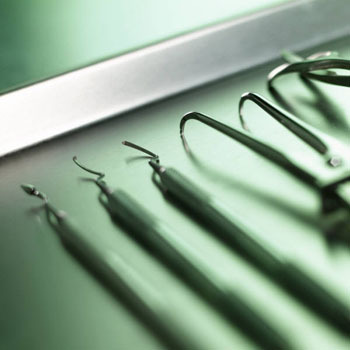 Critical instruments include forceps, scalpels, bone chisels, scalers and surgical burs. Semi-critical Instruments are those that do not penetrate soft tissues or bone but contact mucous membranes or non-intact skin, such as mirrors, reusable impression trays and amalgam condensers. These devices also should be sterilized after each use. In some cases, however, sterilization is not feasible and, therefore, high-level disinfection is appropriate. A high-level disinfectant is registered with the U.S. Environmental Protection Agency (EPA) as a "sterilant/disinfectant" and must be labeled as such. All critical and semicritical dental instruments that are heat stable should be sterilized after each use by steam under pressure (autoclaving), dry heat, or chemical vapor. Before sterilization or high-level disinfection, instruments should be cleaned so that any debris is removed. Enzymatic and non-enzymatic solutions facilitate instrument cleaning. Heavy- duty gloves should be worn when handling contaminated instruments. Instruments should soak in water or disinfectant/detergent as soon as possible after use to prevent drying of debris. Instrument cassettes and mechanical cleaning (e.g., ultrasonic cleaners) may be used to reduce direct handling of contaminated instruments. Applying rust inhibitors will protect instruments from corrosion that may result from autoclaving. Packaging rinsed and dried instruments before sterilization protects them from contamination after they are removed from the sterilizer and during transport chairside or to storage. Please contact us if you have any questions at (630) 893-4200. Also be sure to "share" this article and follow me on Facebook at, Facebook.com/RoselleDental, for real estate and home ownership advice. Please feel free to visit our dental office and see first hand how we meet and exceed cleanliness and sterilization guidelines.